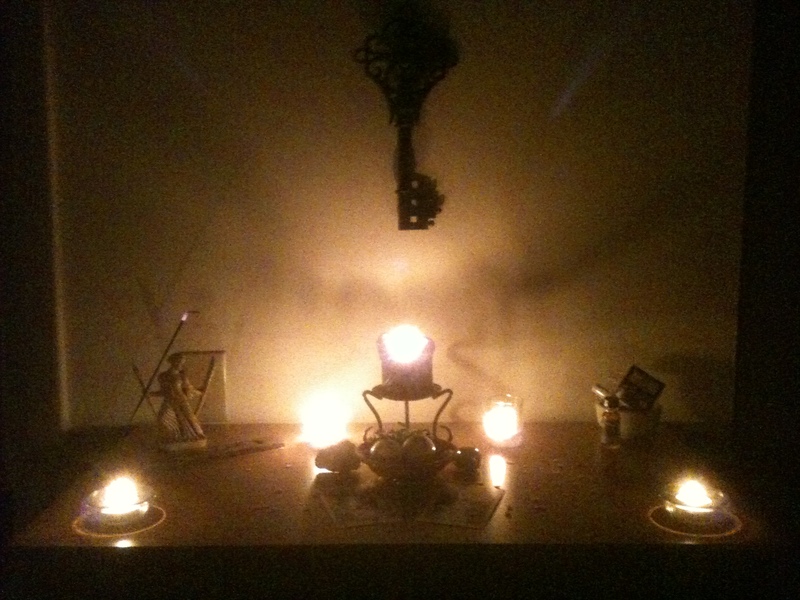 Over the course of two nights (May 31st and June 1st), I cleaned my apartment (lots of vacuuming, dusting, and scrubbing) and on the night of the 1st – the night of the dark moon – in a hellenic-style ritual, I spoke purifying and apotropaic prayers (with a little energy work to seal the deal) and offered Hekate two boiled eggs rubbed with olive oil, powdered garlic, powdered onion, and a pinch of black salt. As a part of the ritual, I also engaged in some meditation, which morphed into full blown journey work in which I met Hekate among the stars and communed with her. It was a wonderful experience! Here are two images of my altar (which is much reduced because I am catsitting and the little guy likes to jump and explore!). The first shows the entire altar with offertory incense, candles, and the deipnon itself (i.e., the two boiled eggs mentioned above). The second is a close up of the deipnon. Also, for anyone who is curious, the three stones are black tourmaline (for purification), snowflake obsidian (for breaking and changing old patterns), and a spherical piece of jet (as a general symbol of witchery – an association that I now have for this “stone” due to many conversations with a geologist/witch). Hail Hekate, Goddess of the Crossroads, Averter of Evil! May you guard and guide us well as we shed the old month and slip into the new. This entry was posted in Ritual & Magical Energetics and tagged Deipnon, Goddess Hekate by Wandering Woman. Bookmark the permalink. Thanks, LB! I like all three stones, especially when working with Hekate, but I was just thinking how much I love the black tourmaline. It’s purifying effects on me are powerful! I think I am going to have to go get more, or maybe order some online. It’s truly fantastic. That’s a very nice picture. 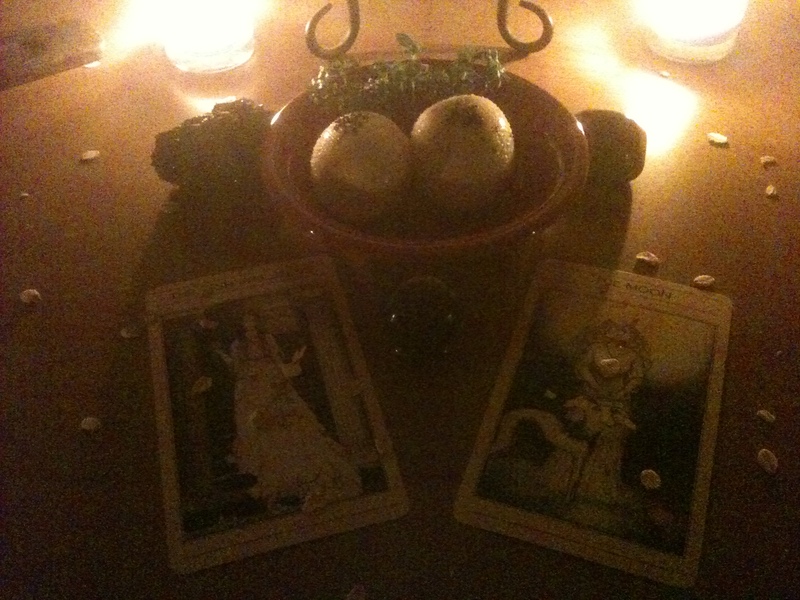 You can definitely read the energy coming out of the center of your altar! I also love that you used the crystals.